7 Mindsets offers 12 years of age-appropriate (K-2, 3-5, MS & HS) curriculum for any school or after-school learning environment. Each course contains 30 lessons that focus on the underlying, non-cognitive skills young people need to live fulfilling, successful lives. In addition to structured curriculum, we also provide quickly-searchable, relevant, discussion-based content through an integrated resource hub which allows educators to easily find and teach from single videos and instructables. Each school creates its own unique formula for using our digital tools. Some teachers use our quick-search modular resources throughout the day, while others engage students in whole lessons. The 7 Mindsets Resource Hub enables teachers to easily search thousands of learning objects, videos, activities and other instructional resources for teaching social emotional learning lessons and concepts. Once the right content has been found, users can build their own lessons and share them with their colleagues. The Resource Hub also allows educators to upload their own content and compile it into blended lesson plans. 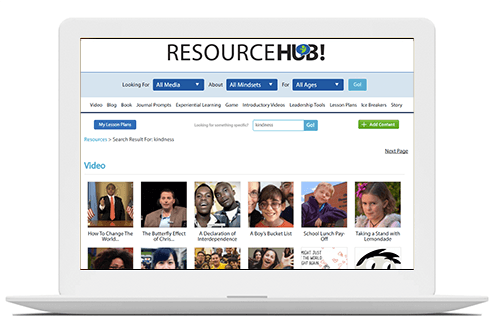 Whether looking for a quick video to illustrate a concept, or adapting an existing lesson with more culturally relevant material, the content organized in our Resource Hub provides a foundation for critical discussion, relationship-building, and classroom community development. A digital repository of activities, ideas and best practices.